It’s always exciting to see young people following their passion, and when they follow through, and do it right, it’s a sight to behold. 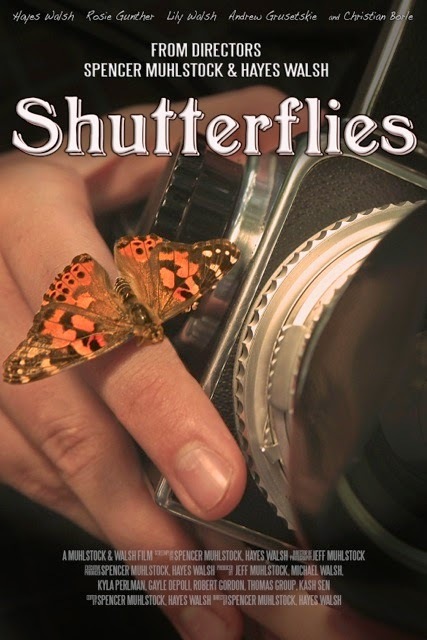 I happen to be speaking to an actor friend of mine, Rosie Gunther McCooe, and she mentioned how she was in a new film by two students at her local high school, called Shutterflies. As with many independent films these days, it was funded through Indiegogo. The movie was premiering at a local theater in NJ, the gem of Ridgewood smack in the middle of Ridgewood’s downtown area. I went with my son, who is doing music for another student film in my town along with the two student film makers doing that film. I figured they would want to see what some fellow juniors in another town could do. It was a freezing cold night in November with barely a soul on the street but inside the lobby it was a whole different world. The excitement there was contagious. Hayes Walsh chats it up with his fans. Borle, just off the heels of starring Steven Spielbergs's Smash on NBC as Tom Levitt and as Max Detweller in NBC’s Live Version of The Sound of Music was quite a coup to have in a lead role. Quite a heavy hitter for a student film, and the boys were quite happy to have him at their premiere as well. Rosie McCooe, who played the female lead, was on the soap One Life To Live as a young actress and has appeared in other local films such as Bad Parents sand the soon to be released Jersey Devil. She played the rough and unappealing though highly-coveted housewife. Anyone that knows Rosie found out what a good actress she was because she is the opposite of this part. Hayes Walsh played Rosie's son. Rounding out the cast was young Lily Walsh, who learned sign language for the part, and Andrew Greusetskie. As the movie played in the packed theater, I realized that the best part of the night was watching the reactions of the kids I brought with me. During the whole film they were, literally, on the edge of their seat in the theater. I could tell that they were just not listening and watching the film, but really, really watching it. The ride home was tremendous, they couldn’t stop talking about the sequences, the camera angles used, the foreshadowing, the stunts – especially the gunshots, the dialogue, the actors, continuity, the props, something about a glass of milk, etc. Theses kids were truly inspired by their peers. I had seen works by this dynamic duo before, at a Film Festival held at this same theater a year prior and then searching them on Youtube. I was so impressed by their comedic short videos that I had already had my son watch them, so when I asked him if he wanted to go see their new film, I just told him it was the “White Crayon” kids” and the one with the head in the Christman box video. As I said earlier the movie kept my high schoolers on the edge of their seat, and I had no desire to take my eyes off the screen either. Having five decades of movie watching under my belt, and probably because I like to figure things out, however, I did figure out who the killer was half way through. But the kids I went with didn’t. Whether you know “who did it" and why or not, it’s not all about the mystery but about the way the story is told, It’s about how the plot unravels and thickens, about how the characters interact, it’s about feeling a part of the movie through the eyes of the camera and feeling what the characters feel, it’s about experiencing the world that the characters live in, in this case a time decades ago, and about the emotions you feel because of the integration of all the elements. This movie is storytelling at it’s finest, and these kids have a very bright future. 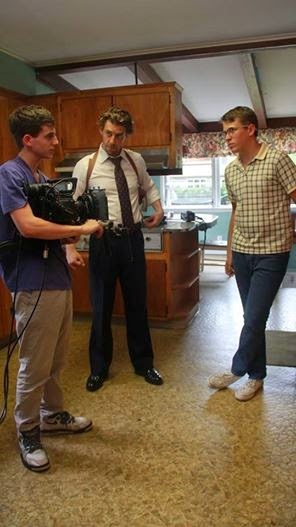 Shutterflies won Best Home Grown Short Student Film- High School at the Garden State Film Festival.